Beatrice Bagola is an expert in Romance philology and, in particular, Romance linguistics. Her research projects comprise the history of French and Italian languages as well as media influences on French and Italian in Europe and Canada. Comparative studies focus on French varieties in Europe (France, Switzerland and Belgium), North America and North Africa (Maghreb). A current major project is concerned with theoretical and practical aspects of: 1. contact linguistics concerning various aspects of influence between English and Romance languages especially French, 2. the question of languages and language variation (diastratic, diatopic, diaphasic, and diamesic variations), 3. questions of standard language and linguistic norm: Quebec French versus standard French. A further field of interest is language acquisition and language maintenance of migrants. A main focus lies on the maintenance of the heritage language of Italians immigrated to Canada, Germany and Luxembourg. Although those speakers had been part of different waves of immigration and had arrived from different cultural and linguistic regions under different social, political and economic conditions, the majority of these immigrants were trying to get into contact with other people from Italy. Beatrice Bagola was able to demonstrate by means of a large number of examples that Italians with a different linguistic background had to use either standard “Canadian” Italian or a new linguistic variety for their daily intercommunication. 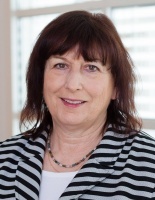 As one of the founding members of the Association of Canadian Studies in German-speaking Countries and coordinator of the former Centre d’études québécoises at the Universität Trier, Beatrice Bagola has long-standing experience in Canadian studies. Due to her close cooperation with colleagues from various Canadian universities she has supported graduate students to establish contacts in Canada in order to prepare their PhD or Master's theses. (ed.) Variétés régionales et variétés nationales du Français en Europe et en Amérique du Nord. Français du Canada - français de France (Tübingen: Niemeyer). "L’américanisation de la langue sur Internet? Quelques aspects de la terminologie officielle et de l’usage des internautes", Globe 7:2, 101–124. "Das Internet als Spiegel der Geschichte der kanadischen Eisenbahn und ihres Vokabulars", in: Wolfgang Dahmen (ed. ), Sexaginta. Festschrift für Johannes Kramer (Hamburg: Buske), 7-20. "Enrichir la langue. Überlegungen zur französischen Sprache im Internet", in: Brigitte Horiot et al. (eds. ), Mélanges offerts au professeur Lothar Wolf: «Je parle, donc je suis... de quelque part» (Lyon: Université Lyon III Jean Moulin), 463-475. "Deux réalités linguistiques: Le français et l'italien à Montréal", in: Kerstin Störl/Johannes Klare (eds. ), Romanische Sprachen in Amerika. Festschrift für Hans-Dieter Paufler zum 65. Geburtstag (Frankfurt: Peter Lang), 61-72.